Deca jump is a skill game in which you will have to help this poor man reach the top of the tunnel before the goo catches up to him. The way you will do this is by moving the balloon you have right underneath him as he starts to lose his momentum. 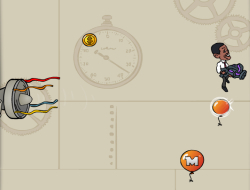 Collect all the coins as you move up with your cursor but also keep in mind that your balloon will deflate with each bounce so you will need to fill it up back by collecting the other M symbol balloons. Try to pick up some power-ups but whatever you do dont let him fall all the way back down. DecaJump 0.00 between 0 and 10 based on 0 votes.